Wish to make a lasting impression in your backyard? 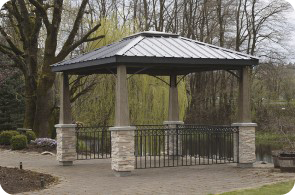 Our Gazebo kits are the perfect choice. 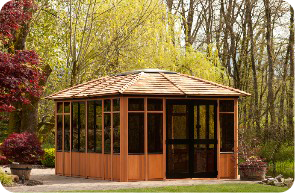 With quality material, impeccable craftsmanship and intricate designs, you can count on our gazebos to be the perfect addition for your spa enclosure. 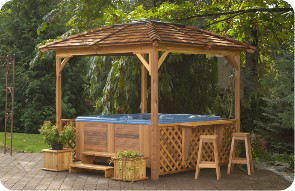 Ideal for a variety of uses, our gazebos work best for hot tub enclosures, spas, resort pools etc. To make sure that your spa gazebo retains its fine ambience and breathtaking allure for years to come, we use only high-quality and durable products and equipment. All our gazebos and spa enclosures are duly checked and tested for quality during all stages, be it manufacturing or shipping. Our gazebos are manufactured using the finest quality of wood that maintains a durable finish in all kinds of climatic conditions. All the spa cabinetry is kiln-dried before use to maximize its strength. Hence, your gazebo not only looks stylish but also stays the same for years to come! 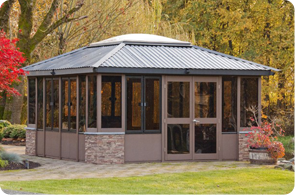 We also make sure that the material we use for our gazebos is resilient to even the most extreme weather conditions. Therefore, you can be assured of their quality and durability in all kinds of locations and climatic conditions. We not only pay special attention to the quality, durability and aesthetic appeal of our gazebos, but also provide the best in customer service. Transform your backyard into your own personal piece of heaven with a stylish gazebo covering your hot tub or spa. So, don’t wait and make your backyard spa come alive with a convenient, beautiful and stylish gazebo. With tons of features and assured privacy, relax and unwind with class in an aesthetic setting!